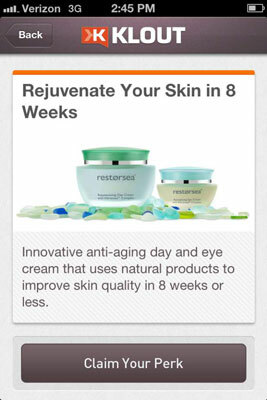 The Klout mobile experience is more limited than the full website. However, many features are still available with the mobile app, including giving +K to fellow influencers, checking your Klout Score, and making simple edits to your profile. And with the implementation of Klout for your iPhone Passbook you can even use Klout to get discounts and on-the-spot Perks in participating retail or entertainment locations. Passbook is an iPhone feature that uses participating apps from companies such as United Airlines and Target to allow you to keep tickets, reward cards, and coupons in one place. The easiest way to make the most of your Klout app is to spend a few minutes getting familiar with all of its features, including the Notifications screen. Think of your Notifications screen as your inbox. Anything that happens regarding your Klout account appears on this page. 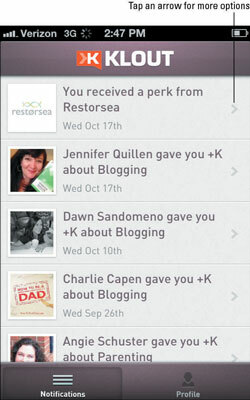 Notifications refresh each time you open the Klout app, but you can manually refresh the screen at any time. To refresh your notifications, drag your finger from the top of your screen to the bottom and release. When you first open Klout with your iPhone or other Apple device (iPad, iPod touch), the first screen that appears is your Notifications screen. Here you see any recent activity that pertains to your Klout account. A menu item marked Notifications also appears at the bottom of your screen so you can return to this list at any time. 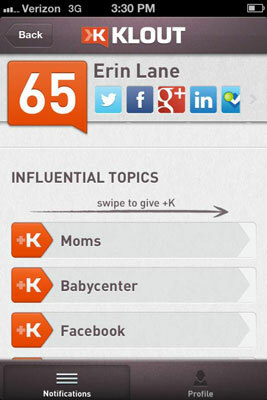 Changes in Klout Score: When your Score rises or falls, you see a notification letting you know your most current Score. New Perks for which you are eligible: If you’re eligible for a new Perk, you see a message on your Notifications screen. 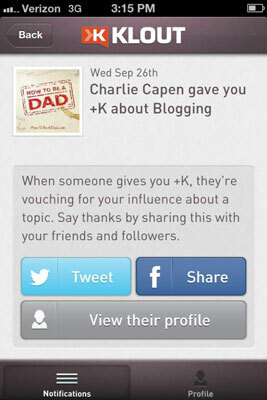 New options for your mobile app: When Klout makes changes or adds new features to the app, an alert appears. Endorsements from other influencers: Influencers that endorse you appear under notifications along with the topic for which they endorsed you. The Notifications screen is interactive. Although it may simply look like a list of notifications, you can actually do quite a bit from this screen, including sending Tweets or Facebook messages, claiming Klout Perks, and viewing the profiles of other influencers. To act on a notification, first select the preferred alert and tap the arrow to the right of the message. If you wish to respond to a notification with a Tweet or Facebook update, you can do so right from the Notifications screen. Select the desired notification by tapping the arrow to the right of the message. A new screen appears with social media sharing buttons. Select the platform you wish to use (Twitter or Facebook) by tapping the appropriate button. A pre-populated status message appears. You can submit this message as-is or make any desired edits. When you’re ready, update your Twitter or Facebook status by tapping the Send button. You must also be signed in to Twitter or Facebook with your mobile device before you can make status updates from your Klout app. If you receive an endorsement (+K) from another influencer, you are notified with his name and the topic(s) for which he endorsed you. From the Notifications screen, you can send a Tweet or Facebook status update to thank him for his endorsement using the instructions above. You can also view his profile. Select the notification with the influencer you wish to view by tapping the arrow to the right of that message. A screen appears with the topic for which you received +K and the social sharing buttons for Twitter and Facebook. A View Their Profile button is located at the bottom of the screen. Tap the View Their Profile button, which opens the influencer’s profile in a new screen. When viewing another influencer’s profile, you can tap her social media buttons to leave the Klout app and open a new social network, view who she influences and who she is influenced by, and give +K on one or more of her listed topics. To endorse another influencer, swipe the orange arrow from left to right on one or more topics for which you wish to give +K. If you see a notification that you have received a Klout Perk, you don’t have to wait until you log in to your computer. You can claim the Perk right from your phone! Select the Perk you wish to claim by tapping the arrow to the right of the Perk information. A new screen appears with more information about the Perk. Tap the Claim Your Perk button. Follow the instructions to verify your address information and tap Submit. If the Perk is full or has expired, you can’t claim it. 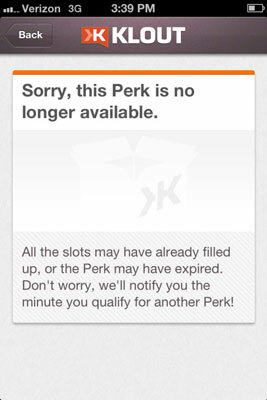 If you don’t want to miss any Perks, make sure to check in with Klout on a regular basis. 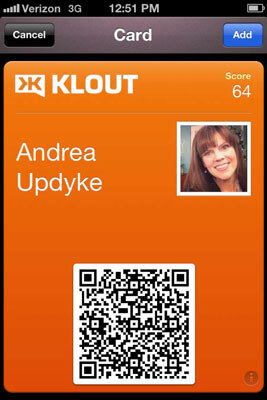 Occasionally, Klout partners with restaurants and/or hotels to provide in-person Perks or discounts. If you become eligible for one of these special treats, you’re asked to show your Klout card, which is simply your name and Klout Score along with a QR code for the establishment to scan. Open your Klout Notifications screen. Tap the Add Klout to Passbook notification. 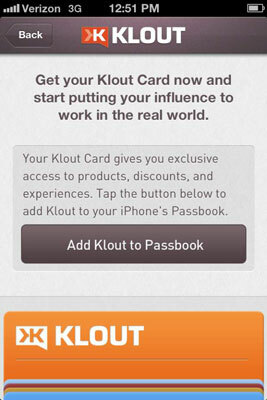 Tap the Add Klout to Passbook button. Tap the Add button in the top-right corner to add or update your card. 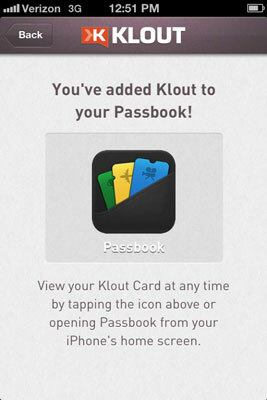 A confirmation screen appears when you have successfully added your Klout card to your Passbook.